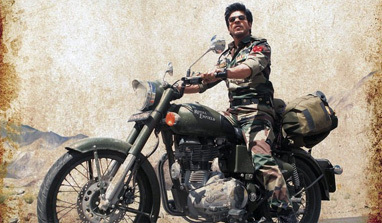 Mumbai: Superstar Shah Rukh Khan is happy that he is playing an army officer in `Jab Tak Hai Jaan`, and hopes it can help popularise the forces. "I am glad that I am playing an army officer. I feel good that by portraying characters from armed forces in our films, hopefully, we can popularise the profession because our army, navy and air force is beyond the profession, it`s a dedication to your nation, this is what I feel," the 47-year-old said here Friday during a press conference held on his birthday. Shah Rukh says he would be glad if even one young boy is inspired to join the armed forces after watching the film. "When I was shooting in Kashmir, many officers used to meet and ask `You are doing na`, so, now may be the boys (are getting inspired). I don`t know if they will (get inspired). But if I am able to do that through this film or through `Fauji` or if one person decides to do that, will be really nice because it is the most honourable and noble profession to be in the armed forces," Shah Rukh said. Shah Rukh had earlier also played an army officer in `Veer Zaara`. `Jab Tak Hai Jaan` also stars Katrina Kaif and Anushka Sharma and hits theatres this Diwali, Nov 13.